The health club near to where I live is large, ultra-modern and quite busy. There is a lot of great equipment, and most of the cardio machines have small televisions built in with access to many cable channels. When I am not on the road, I enjoy working out to work off the hotel food. I usually show up at the gym early and get my exercise in before starting the day or driving to the airport. About a month ago, I went to the club in the middle of the day. Not surprisingly, there was a whole different set of people exercising, stretching and lifting weights. I like to use the recumbent bicycle as it is easy on my knees. I adjusted the seat in a row of about ten such bikes, each one with a built-in television. The only bike left was next to a man I can only describe as “massive.” I don’t mean overweight; I mean 6’7,” close to 285 pounds and muscular. I would say he was in his late 40s. He had a ready smile and nodded hello. I nodded back. I would later find out that the man was a retired professional football player, a defensive lineman. His laugh was absolutely infectious. It came from somewhere in the middle of his soul. It was fun to hear him laugh. I didn’t want to be intrusive, but after a while, I snuck in a glace at what he was watching. It was the Golden Girls! At first, I thought a man of this size might be looking at ESPN or the NFL Network, but there were Blanche and Dorothy and Dorothy’s mother sitting around the breakfast table. I have no idea what they were saying, but he was enjoying every word. Suddenly, I remembered a few other incidents of a similar nature. While signing books at an annual association meeting of CPA’s, I had a lovely conversation with a young woman who bought a copy of my first book, “Enjoy The Ride.” She was wearing a business suit and had a smile that spread across her face and could light up a room. She complimented me on my keynote (which is always gratifying). I was talking about happiness. 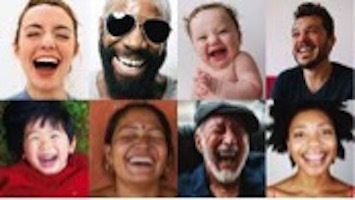 Psychologists and physicians tell us that laughter, real gut-splitting, rolling around on the floor type laughter is not only fun but is healing and restorative. I truly believe that as a society we have lost our ability to laugh. We need to get it back. Many people in these sometimes contentious and mean-spirited times know how to mock, belittle or be sarcastic, but it is nothing like having a good laugh where we feel our very souls uplifted. Deep inside each one of us, is something that brings out laughter and merriment. Please find it and practice it. Whether it is The Golden Girls, belting out a funny song or watching Moe, Larry and Curly, we all need a daily dose of humor. For more information about Hall of Fame speaker and bestselling author Steve Gilliland and the Gilliland Foundation, please contact steve@stevegilliland.com / 724-540-5019 / www.stevegilliland.com.